Earn your bachelor's degree in business administration online from UW-Parkside through the University of Wisconsin Flexible Option. From high school dropout to BSN graduate and assistant head nurse, UW Flexible Option proved to be the best choice for Tiffany Breezee and her career. Could You Earn a Fast, Online Bachelor’s Degree in 12 Months? In traditional programs, a bachelor’s degree completion program generally takes two or more years to finish. Compare that to a self-paced, competency-based education program where your pace is truly up to you. In this format, it's possible to complete a fast, online bachelor's degree in 12 months. Tyler Coady earned his Bachelor of Science in Information Science and Technology in only nine months. Here’s how he did it through UW Flexible Option. If you want a degree program that’s self-paced and affordable, you’re in the right place. Online, competency-based University of Wisconsin Flexible Option programs are designed exactly for adults like you. What might your study plan look like if you wanted to complete your degree in 12 months? 18 months? 24 months? Find out how UW Flexible Option made it possible for Maggie Zoerb, age 33, to earn her bachelor’s degree, which not only boosted her career but also fulfilled a promise she made to her father. With UW Flexible Option, students aren’t tied to semester schedules and instead choose their own pace to complete their degrees. Denise Herriges chose to finish her RN to BSN degree in two years. Here's how she did it. A health sciences degree prepares you to assume a wide range of roles within both clinical and non-clinical settings. Students earn this degree to advance their current healthcare careers to the next level, change jobs or industries, and prepare for graduate or professional programs. U.S. Marine Corps Sergeant Matt Rose trained at military installations from Minneapolis, Minn. to the Horn of Africa. He applied the GI Bill to help fund his bachelor's degree, earning his IST degree at his own pace through the UW Flexible Option. With UW Flexible Option, students set their own pace. 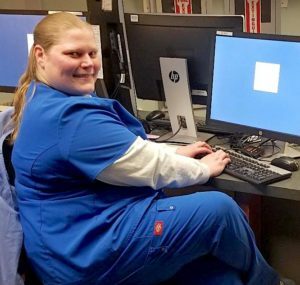 Cathy Zornes, a successful IT consultant who travels all over the U.S., chose to complete her bachelor's degree in three years. UW Flexible Option is so flexible that each student sets the pace that works best for them. In this series, three Information Science and Technology students share why they chose the pace that they did. In the first part of this series, Andrew Hybert tells us why he chose to graduate in six months.